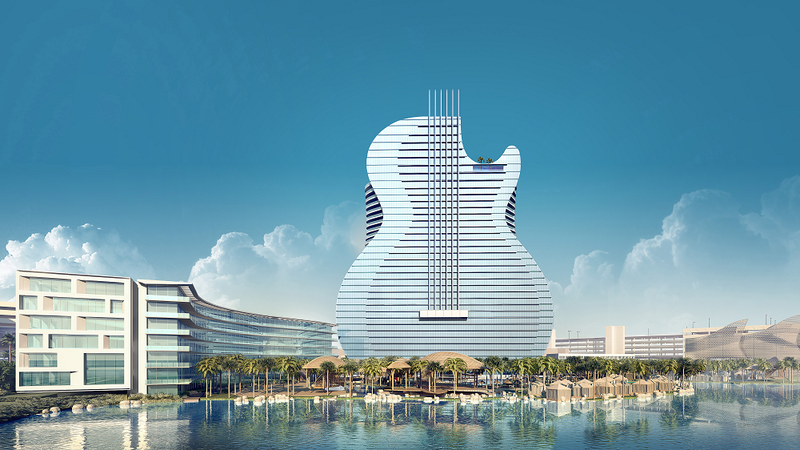 The Seminole Hard Rock Hollywood Hotel is close to topping off its new 450-foot guitar-shaped hotel tower, which will be an architectural homage to the Gibson Les Paul in blue glass that will be visible from miles around the Fort Lauderdale and South Florida metro area. The tower is part of a $1.5 billion expansion plan for the Seminole’s flagship property that began in 2016 and will add 806 additional guestrooms and suites to the facility, with 638 of them in the tower itself. At the base of the tower will be a 13.5-acre pool resort complex dubbed the “Bora Bora Experience,” with private villas surrounded by pools and waterfalls. Hard Rock International, the Seminoles’ commercial arm, announced on Thursday that the tower was due to lay its final beam in the next three weeks, finishing ahead of schedule. While giant electric guitars are very much part of the Hard Rock’s brand, the Hollywood hotel tower is such an architectural challenge that it took creators close to a decade to figure out how to to construct it. CEO of Seminole Gaming and chairman of Hard Rock International Jim Allen explained during a guitar-smashing ceremony on the construction site, back in October that he had the idea for a guitar-shaped hotel way back in 2007. 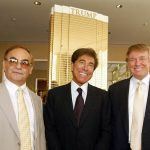 However, the concept initially had architects stumped and the first design attempt was simply a regular hotel tower with a glass front in the shape of a guitar. Hard Rock announced a ceremony will take place on July 9 for the placement of the final beam — and presumably after that they will just need someone to tune the thing. The new complex will be fully completed in mid-2019 in Hollywood, Florida. It looks like the Hard Rock Hollywod Tower is trending better at the moment than its counterpart in Atlantic City, which is putting finishing touches on its own Hard Rock Atlantic City, due to open next Thursday, June 28th. 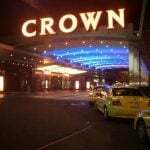 Attentive residents of Atlantic City spotted that the 30-foot Les Paul installation hoisted up onto the former Trump Taj Mahal on Thursday contained a typo. Workers hurried to remove the offending vowel and now the grammar police can exhale a sigh of relief, as an expensive editing process was successfully completed.